Welcome yourselves to the tail end of autumn and begin to prepare your body and minds for the winter that is upon us. We've been lucky with gorgeous, crisp weather so far, and I can hardly wait for the first snow! I've got my new maternity winter coat ready to go, and a kicking little guy who just has to make it through the coldest snap til early March when he is supposed to arrive. For now, my latest pose of the moment, is extended side angle pose (utthita parsvakonasana). You know it. It's the one I bring you into quite often from Warrior II. It brings the leg strength, side-body opening, spine lengthening, and arm extension that feels so good to me right now in my bigger belly state. Practice it with me this month (big belly or not) to get your body open and strong, too! *With so much to do this month and travelling coming up, plus the growing belly, I've decided to drop my T/TH classes. I hope to still see many of you during the noon slot and just around Karma taking other classes, as I hope to make time for some more of that myself. If you want to chat over tea or plan to attend another class, shoot me a line, and maybe I'll be up for meeting some of you around. **I will be subbing in my old timeslot this coming Monday, Dec. 6th for Erica at 10:30! If you're around, I'd love to see you then or right after at my noon class. Lakota will teach my noon class on 12/22, 12/27, and 12/29. Kate Heffernan will teach it on 12/31. Prenatal Class will not take place on 12/22 or 12/29. It will resume in the new year on Wednesday, Jan. 5. 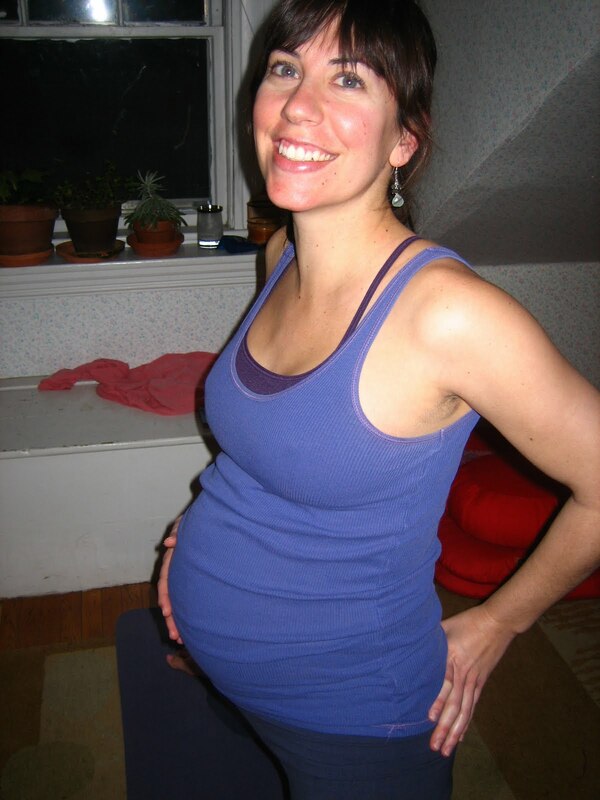 **For those of you who don't know about Michelle yet, she is also a yogini/mom-to-be who happens to be a wonderfully skilled holistic health practitioner. Sad to say, she has now left the Boston area for D.C. but lucky for us, we can be in touch with her anytime via our world wide web. ;) Her website and blog are part of my weekly updates for important health info or recipes. She just came out with her Holiday Recipe E-Book, which is so exciting! If you're looking for fast and easy recipes that you can bring up on your computer or iPad, then this is your answer. Check it out! **Nazarene Zabel concocts the most delightful and organic herbal skincare around. Her products are luxurious and pure, so they make great gifts! I've been using her products for years now and can attest to their power. Not only are Naz's products high quality, but they are made with the utmost care and vibrant healing energy that she possesses. If you're local, she's having an open house next Friday, Dec. 10 in Cambridge where you can test/purchase her products in person (email me if you're interested), or make sure to get your etsy order in by Dec. 12 so she has time to make everything before taking off on her holiday. **These are the super cute and cozy eye pillows that some of you may have seen for sale at Karma Yoga Studio in Cambridge. An Li is one of my fellow yoga teachers there, who also happens to be a lovely artist. These pillows are the perfect simple gift for those in your life who practice yoga or meditation (or who might be a new mom needing some sleep/relaxation). They are just $25 and come with a handy little carry sack. *Olof Arnalds' latest album, Innundir Skinni is just magic to the ears. She has a song with Bjork singing backup, called Surrender. *Jonsi's Go Live DVD and album. With songs that weren't on his album, but that he played live in concert, it's more than a treat. I'm waiting for the hardcopy to be shipped my way! May all of you enjoy the magic of this month. Happy Hanukkah this very moment! Merry Christmas, Happy Kwanzaa, and New Year to come! No matter what your family traditions are, or what you celebrate/honor, it's a time to smile at your neighbor and use your practice for peace.